The health care industry represents a dynamic marketplace that presents many opportunities and challenges for health care professionals. It is essential that current and future health professionals align themselves with organizations like the National Association of Health Services Executives (NAHSE) that help to connect health professionals across the country. NAHSE is an organization of health care professionals from all around the nation who are actively pursuing excellence in the field of healthcare management and advocating for the medically under served. By becoming a member of NAHSE, you can actively participate in enhancing your career. 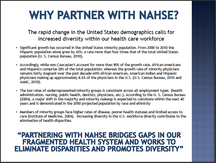 NAHSE strives to serve as a vehicle by which African-Americans health care leaders can help improve the health status, economic opportunities and educational advancement of the communities we serve. You too can be a part of this vehicle of opportunity. NAHSE offers special membership types for current executives, students and organizations. To determine the type of membership that you qualify for, please read the membership guidelines below. We welcome and encourage you to join NAHSE by either quickly applying online or by downloading our interactive membership application through the links below. Click and fill out online form for NAHSE Chicago Membership. Total Number of Members as of September 2015. 77 individual members, plus 4 institutional members for a total of 81 members. Download PDF below and read more on exclusive NAHSE membership. Download PDF application below and sign up for NAHSE NOW! Annual Educational Conference with healthcare related programs and well-known speakers and eligibility for up to nine category II ACHE credits. Emerging Leaders Health Care Forum for students and early careerists. • Persons with a background in health and medical care administration and health services delivery systems having experience in these fields that can be considered adequate to have attained an in-depth knowledge of the chosen area of endeavor.